Parc y Scarlets presented the UK's hottest FMX athletes in an action packed airborne battle, Wednesday 6th June, as thousands of people packed the stadium's Castell Howell South Stand to enjoy an eye-watering feast of the best tricks, the biggest air and the sickest whips! 2009's Big Air Jam champion, 30 year old Jamie Squibb, was crowned 2012 champion after a thrilling Best Run Final against former school boy motocross champion Daniel Veale. Last year's champion and 2012 Master of Freestyle Motocross Chris Birch missed out on the final despite some impressive moves including aa one-handed heart-attack seat grab and a rock solid.On a fine and sunny evening which saw a near capacity crowd, in the south stand, Llanelli's Parc y Scarlets once again showed that's its fast becoming the premier venue in West Wales for a wide variety of sports and culture. 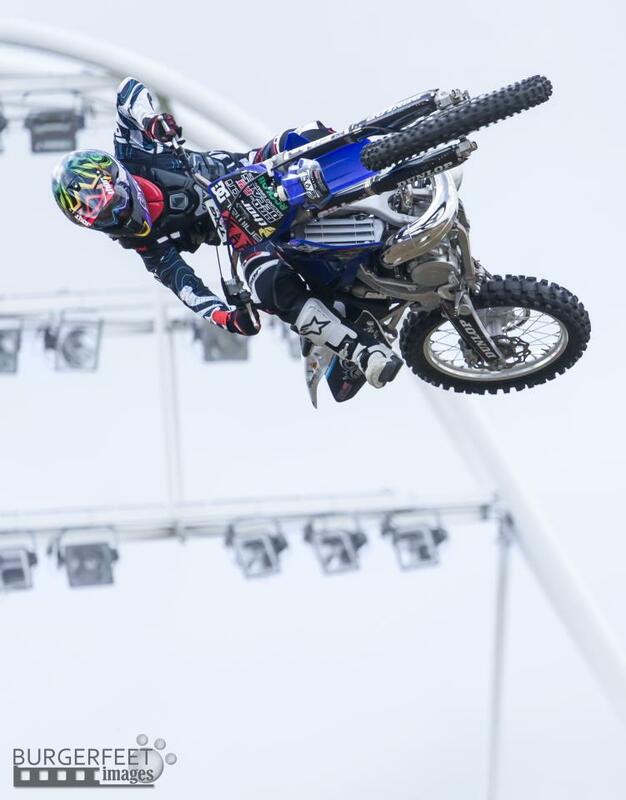 The thrill of athletes jumping 40 feet in the air pulling acrobatic stunts over gaps approaching 100 feet, whilst on a motorbike, drew nervous gasps and cheers from the on-lookers as MT3's Big Air Jam Freestyle Motocross Championship rocked Parc y Scarlets. Parc y Scarlets' Head of Events Rupert Moon said: "Big Air Jam is a radical competition and we were all thrilled within an inch of our lives as we watched some of the best rider perform some amazing stunts. "The combined experience of sight, sound and smells within an arena like Parc y Scarlets ensured that it was a truly multi-dimensional spectacle and we had a great reaction from the crowd. The Big Air Jam riders, or Gladiators of the Ring, certainly mesmerised the biggest adrenalin junkies as they performed breathtaking stunts.The evening's other winners included BMX enthusiast Kye Forte who high jumped a 2.5m bar to impress in the Stunt Wars.Crowd favourite Birch took the Sick Trick trophy after a phenomenal back flip with Big Air Jam 2012 champion Squibb also winning the Whip Contest.